What Should You Consider When Finding a Knee Brace? 1) Type of knee brace. 1. Knee Brace Support by Winzone. When looking for a knee brace, it isn’t just a matter of picking the best price or most-popular brand name. Instead, it involves a combination of many factors concerning your knee’s shape and why it’s affected (e.g. injury, instability, etc). Knowing your body first will better gauge what will be the best knee brace to purchase. One way is to first research any possible symptoms of your knee, in order to determine just what might be causing it to hurt or to be weak. You might even need to consult with a physician if the matter is too complex for you to know. Once you find out what is bothering your knee, you can move on to selecting your knee brace for fitting. ​This is the first thing you ought to think about when searching. Many are used for different purposes, whether to rehabilitate sport injuries, treat arthritis, or generally reduce knee strain when walking. These types of braces are especially used for injuries or post-surgery knee operations. They are used to provide stability while the knee heals, and can be worn for six to twelve months. However, while functional braces have their benefits, wearers have found them to be hot and uncomfortable, as well as irritate the skin. They also do not guarantee knee stability to return to normal, so working closely with a rehabilitation program will better help accelerate the healing process. 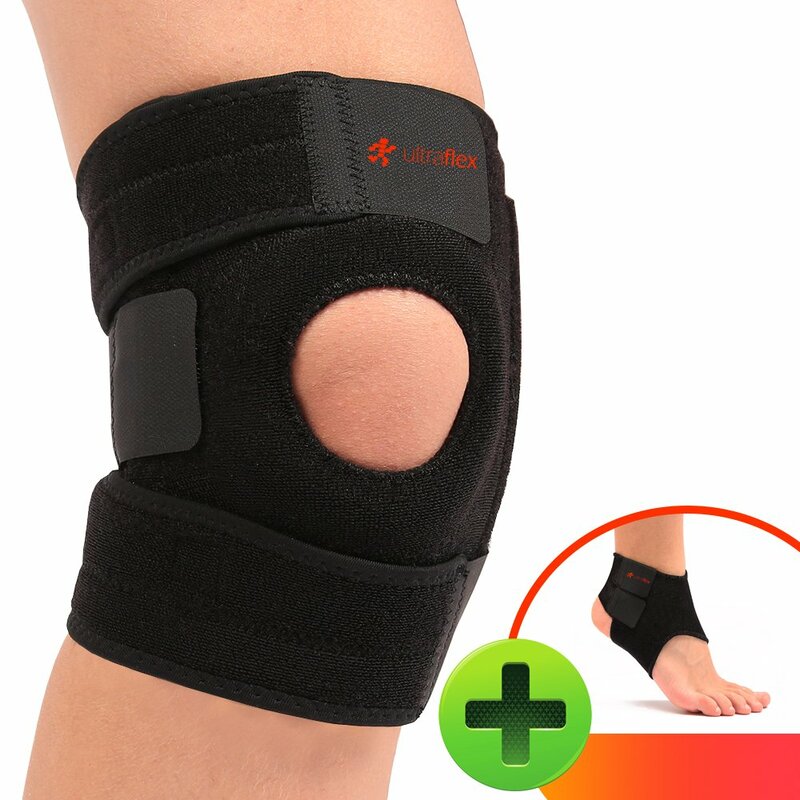 Used almost exclusively for sports injuries related to the medial collateral ligament (MCL), prophylactic braces can also be used to reduce knee stiffness, as well as provide stability to other areas within the knee (e.g. ACL, PCL, LCL). Although there have been studies showing few issues with wearing this specific brace, others have reported it as a problem for patients who believe it to work well and return to strenuous activities before being completely healed. As a result, it can add to the injury, thereby worsening it. That said, giving time to let the knee heal is just as important as wearing the brace. Similar to functional braces, this type is also used for healing after surgery. However, they are usually worn only for two to six weeks and are meant to limit knee movement while it heals. .Some studies, though, have said that wearing rehabilitative braces does not make much of a difference when it comes to healing the knee, especially when a surgical operation has already corrected the injured area. Knee stabilizer. Consists of metal spring on both sides of the brace to keep you upright for support. Knee sleeves. Serves for convenience, as it can be slipped on and off easily. Knee support. Are adjustable wrap-arounds, and also helps with compression and warmth. Hinged braces. Contain jointed parts that closely mimic the natural mechanisms of the knee. Magnetic braces. Have built-in magnets to soothe the injured area and improve the healing process. ​Neoprene braces. Provide heat and decreases swelling. Closed or open patella. Braces with a closed patella serve to equalize compression throughout the entire knee, while those with an open patella are for reducing pressure from the knee cap and also better track its movement. Basic. Used for short, minor injuries, basic level offers low assistance at a low cost. Advanced. Easy to adjust and durable, this level provides moderate support by reducing stress throughout the knee. ​Elite. The elite level gives high stability to the knee, especially those that tend to be weak following surgical operations. Knee Pads. For people who often perform activities involving the knee, these pads provide the ultimate cushion for kneeling and other movements. Now that you’ve done your research in finding the best knee brace to purchase and wear, it is time to go ahead and look at a few products. It is by no means an extensive selection, but rather a way to help you get an idea of what works (or doesn’t work) for you and your body. No matter what you choose, know that it’s important to get your knee healed and back into doing what you love to do, namely, running! 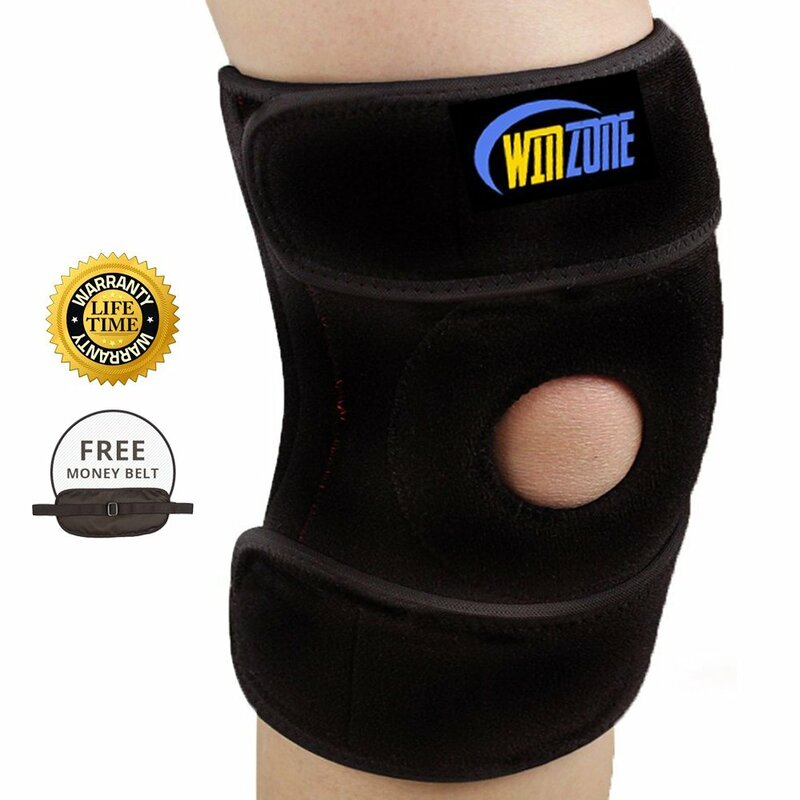 1.﻿﻿﻿﻿﻿ Kne﻿﻿﻿e Brace Support﻿﻿ ﻿﻿by Winzone﻿﻿﻿﻿﻿﻿﻿﻿﻿﻿﻿﻿﻿﻿. This all-around knee brace can be worn for any kind of activity, from running to contact sports such as basketball,biking. Its one-size-fits-all design and built-in strapping system allows you to slip it on with ease, as well as adjust accordingly to your knee’s shape and size for the best fit. When purchasing the knee brace, it comes with a lifetime warranty and a money belt, which is good for carrying items (e.g. keys, cellphones) while on long runs. Many of its users have reported satisfaction with the product, and wished that they could have discovered it sooner! ​Fabric material offers flexibility and long durability. ​Discomfort when worn for long periods of time. 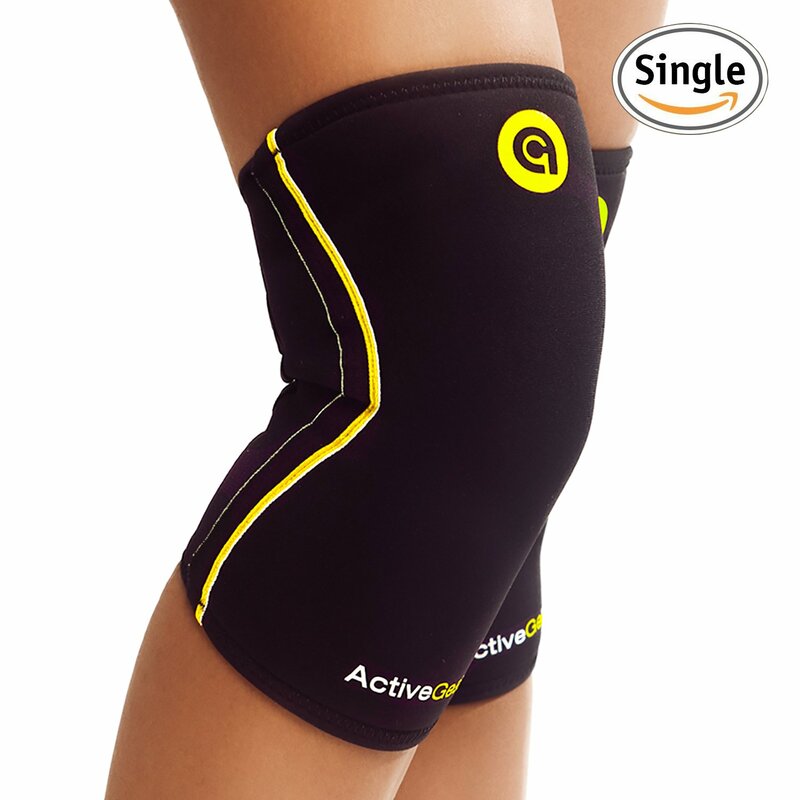 While it is typically geared towards alleviating arthritis pain, ActiveGear’s knee brace is also adapted for supporting the knee during strenuous exercise (such as running), pressure from the daily chore, and post-surgery. 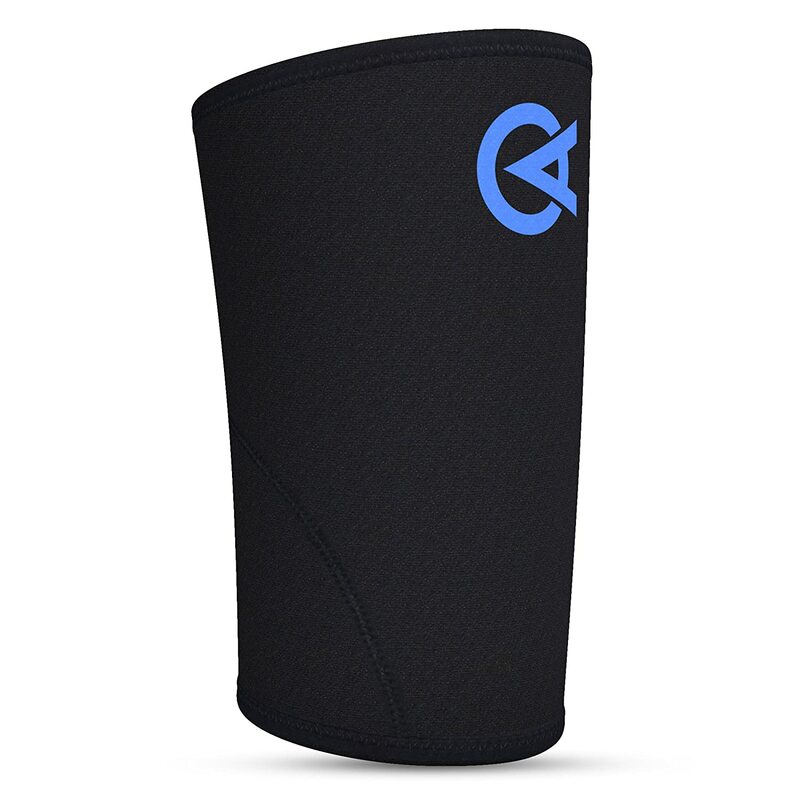 It is made from Neoprene, which is good for inducing heat and preventing swelling from occurring during activities. Another good feature is the five different sizes to choose from, which for many people suffering from knee problems would find beneficial based on their knee’s shape. Five different sizes for all types of knees. Gives compression and warmth for improved circulation. Able to be used both for sports and after-rehabilitation sessions, Ultra Flex Athletics’ knee brace is unique in its design and shape, containing both neoprene and silicon material for the ideal brace-fitting experience. This product also has a waterproof feature that, despite whether you swim or sweat, will not slip off for any high-intensity exercise. Waterproof features; no need to worry about sweaty knees anymore! Silicone strips to warm up the knee. Restricted motion from the shortened middle strap. 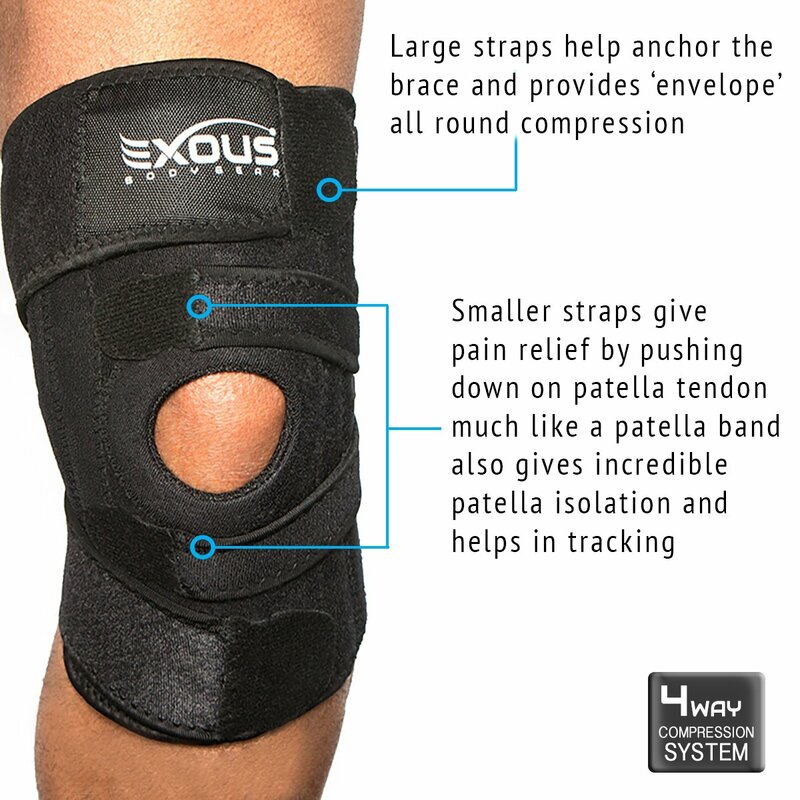 Specially designed for relieving pain from patella tendonitis other related injuries, the ExousBodygear EX-701 knee brace does so by compressing the patella tendon and pushing it in to reduce inflammation. Another nice aspect of it is the open-patella structure, which helps anchor and corrects the knee structure for improved healing. It is also less prone to irritating the skin compared with other products, which is a good feature for users who wear the brace for many hours each day. Less irritation against the skin. From running to playing with your children, Crescendo Athletics’ knee brace offers a diverse range of benefits to keep you fit and active every day, while also assisting in speeding your knee to recovery. Simple in design, but complex in function, this product both soaks up the sweat during heavy workouts while at the same time reduces inflammation caused by moving about for long periods. For many green enthusiasts, Crescendo Athletics provides a knee brace that is FDA-approved for its eco-friendly material sources. Besides feeling good while working out, you can also feel good that you’re doing a big service to protecting the environment. As the old saying goes: be lean, be green! Size chart only in small (S), medium (M), and large (L). Although it was a close call, in the end, Ultra Flex Athletics’ knee brace did it for me. What made this product stand out from its competitors was the ability to provide good security, compression, and extra ankle support, which was a huge plus. While wearing it, I experienced no slip offs and definitely no sweat on the back of my knee, which tends to occur when using other knee braces. On the technical level, this functional brace was good to wear for more than six months, since my injury required a longer time to heal. Support level was on the advanced side, as I was able to use it for most moderate levels of activity. I would say that, overall, I much prefer this knee brace for my day-to-day routines, whether it be running or simply taking a walk around the block.